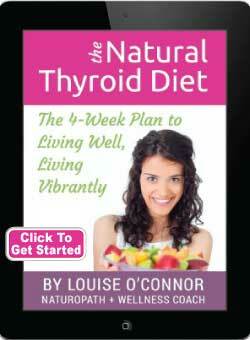 Having a tough time losing weight because of your thyroid and diet? You’ve probably said this if you have thyroid disease—and with good reason. To the great frustration of many of the 27 million Americans with thyroid gland issues, the thyroid has a profound impact on metabolism. Unintended weight gain and weight loss are common, and both can be a daunting challenge to rectify. Although weight may be the most common complaint, clients are at an increased risk of cardiovascular disease and diabetes, underscoring the need to eat a balanced diet and adopt a healthful lifestyle. 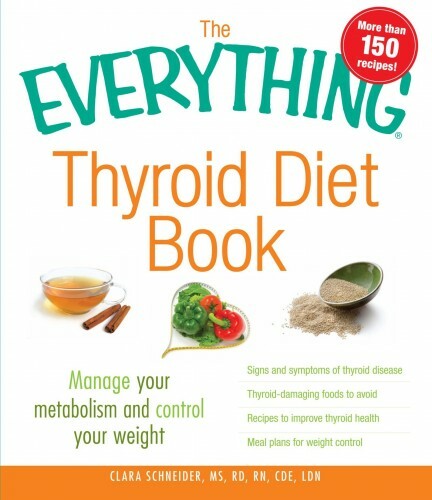 But since one-half of all people with thyroid disease are undiagnosed and weight changes are a common symptom,1 Registered Dietitians are in a prime position to spot potential thyroid conditions, make appropriate referrals, and help clients get a timely diagnosis and the treatment they need for a healthy, thyroid diet. This article will provide an overview of thyroid disease, its relationship with cardiovascular disease and diabetes, and the role nutrition plays in maintaining thyroid health and diet. Emphasizing lean proteins, vegetables, fruits, heart-healthy fats and omega-3s, high-fiber foods, and appropriate portions in diet can help manage or prevent illnesses associated with thyroid disease. As Schneider notes, “It’s eating for prevention of all these diseases that accompany thyroid disease: heart disease, diabetes, cancer, and more.” As an added bonus, fiber can relieve constipation that people with hypothyroidism often experience. The highest concentration of selenium is found in the thyroid gland, and it’s been shown to be a necessary component of enzymes integral to thyroid function.14 Selenium is an essential trace mineral and has been shown to have a profound effect on the immune system, cognitive function, fertility in both men and women, and mortality rate. Soy is another potential goitrogen. The isoflavones in soy can lower thyroid hormone synthesis, but numerous studies have found that consuming soy doesn’t cause hypothyroidism in people with adequate iodine stores.19 However, Dean cautions clients to eat soy in moderation, if at all. Thyroid disease presents unique challenges due to undesired weight changes, significant cardiovascular risks, and symptoms such as fatigue, mood changes, and gastrointestinal upset, which can hinder the development of healthful behaviors. It’s vital that dietitians focus on setting realistic goals for heart-healthy changes and regular exercise when counseling clients about their diet and lifestyle. With so many potential nutrient deficiencies and interactions with medications and supplements, it will be important for dietitians to coordinate with their clients’ healthcare team for optimal health outcomes. Cheryl Harris, MPH, RD, is a dietitian in private practice in Fairfax and Alexandria, Virginia. She’s also a speaker, writer, and health coach. Learn more about her, here. 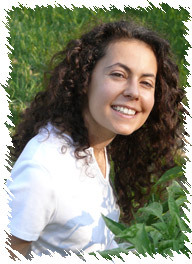 Follow her on Twitter and check out her website at Harris Whole Health. Read the original article, here. 9. Dietary supplement fact sheet: iodine. Office of Dietary Supplements website.http://ods.od.nih.gov/factsheets/Iodine-QuickFacts. Reviewed June 24, 2011. Accessed January 17, 2012. 20. Elnour A, Hambraeus L, Eltom M, Dramaix M, Bourdoux P. Endemic goiter with iodine sufficiency: a possible role for the consumption of pearl millet in the etiology of endemic goiter.Am J Clin Nutr. 2000;71(1):59-66. 24. Egert S, Rimbach G. Which sources of flavonoids: complex diets or dietary supplements?Adv Nutr. 2011;2(1):8-14. 25. Cutovic M, Konstantinovic L, Stankovic Z, Vesovic-Potic V. Structured exercise program improves functional capacity and delays relapse in euthyroid patients with Graves’ disease.Disabil Rehabil. 2012;Epub ahead of print. Questions or anything to add about diet and thyroid? We want your thoughts in the comments section–Please! Observations from a 75 year old hypothyroid woman born in the US, but living in Africa (10 years), England (35 years) and now France (1 year). I’ve had a ‘thyroid issue’ since my mid-20s. Then my medication was 1 gr of natural thyroxine. Over the years I was switched to the synthetic which, in hindsight, was not as stable as the ‘natural’. To cut a long story very short, I’m back on the ‘natural’, eat mostly organic/locally grown seasonal food, cut out a lot of dairy and after testing, take an impressive array of supplements. WHY? Because, in a global food market, we’re all eating ‘junk’ food, that is food that has been sprayed and contaminated so that there’s very little nutrient left. 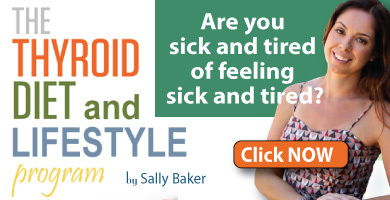 The European thyroid network is alive with young woman who are now taking massive doses of thyroxine and it is here that we must look to the environmental factors that are making us all ill. Doctors are not keeping up, nor are they familiar with issues of nutrition. Pharmaceuticals know this as they have provided the destruction of our eco-systems and of course now, they will provide ‘the cure’. It’s very profitable to have so many of us needing a tablet or two. What to do? In the US the problem is overwhelming. In Europe, we’ve banned GMOs and pesticides in many areas but there’s a deviousness about profiteering businesses and the answer here is to get really angry and don’t let them get away with it. I don’t know how you 30-somethings are coping and are truly pissed off on your behalf! Thank you for sharing. Would you be interested in writing your thyroid journey to share as a Thyroid Thrivers?